Sailing Daily For Sea Bass - Weather Permitting - (Nicking a few flounder too - Really Few!) Saturday's 6:30 to 3:30 - $125.00 – Otherwise 7 to 3 at $110.00..
Have lots of room for 6/6/17..
Hurricane Murray sorely outfished by his neighbor, Flemming..
Been some fine weather of late. Not so much this week coming, but was nice to get out daily for a stretch. We actually got more days of fishing in February than in May. A lot of that's due to regulation, but weather too. Don't tell anyone, but I read on FaceBook NOAA controls all of it. Painful to the male psyche. Maybe the guy next to her had a terrible day. Murray was high-hook Saturday, but took an anatomy whopping Friday & Sunday. Fishing can be like that.. Most days we'd have a few folks with a limit & everyone else wherever their luck landed them. Going to be just a few less limits now I think. We are starting to see some flounder. ("Fluke" from New Jersey north..) A keeper a day & a couple throwbacks. You cannot make fluke arrive because you want them..
Will be targeting sea bass for a while yet. Having written the word, I guarantee someone's going to get off the boat with a long face, "You said flounder were biting.."
Nope, just seeing some accidentals. Carried a bachelor party last week, my friend Dave Sikorski. Seems our CCA MD Director found him a wonderful gal that can outcast him. For once the majority of guys showed up sober and respectful of the ocean's power to amplify any hangover to near-death. I tell all these parties: go fishing first, then party -- or go do something else. Usually they get great video of the Best Man seasick as a dog. Had a trip a couple years ago where the groom & a few others were fine, but the majority were horribly hung over. With accomplices, I convinced our crowded sick-ward the Coast Guard wanted a medical inspection of the boat: Too Many Sick. We would have to wait for hours at the quarantine buoy just offshore and have a medical team board. "It may not be until after dark when we're allowed back ashore!" They never caught on till we were inside the inlet. Among those that do go fishing again, I guarantee they won't carry-on all hours of the night. Last year on the first of August we had a boat, dern near a ship, show up off the coast and begin surveying some reef sites. They had Navy divers aboard also. Never did find out what they were after. The radio man told me they were running a sub-bottom profiler, an especially powerful depth sounder more akin to ground penetrating radar. As this rig declared a large CPA (closest point of approach,) and ended up spending about a week on one our most popular reef sites, the African Queen Reef: fishing was effectively closed there while they were in position. . . I'll tell you a tale of the first time I understood precisely what was happening with a sub-bottom profiler. In 2007 the MD Research Boat Kehrin, skippered by my good friend Rick Younger, arrived on scene at the newly issued Jackspot Reef Site permit. Gail Blazer, an engineer with the Town of Ocean City, and myself had walked that permit through the Army Corps process for close to a decade. I'd done the dockside legwork, working with the trawl community especially, to ensure we would be approved. 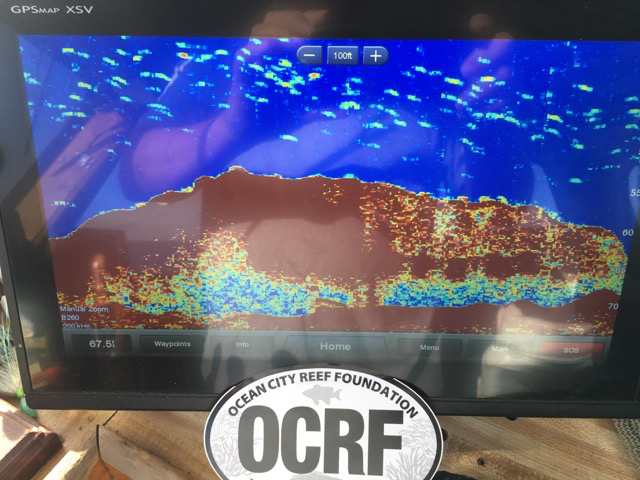 It was an exciting time -- reef material would soon be OK when Rick did his side-scan sonar work. 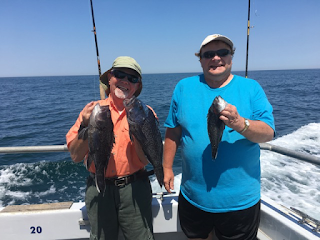 Clients were catching amazingly well -- double headers of sea bass around the rail. ..and our bite came to an INSTANT stop. Literally: "Like flipping a switch." I hailed him on the radio, "What did you just turn on?" He told me & turned it off. After only a couple minutes of a sub-bottom profiler, the bite resumed at a much slower pace..
We fish there a lot more now - that new reef. Never have trouble with scuba divers anymore. Used to be a long steam for someone if anyone was already on the wreck. The new reef was crazy productive for a while. That pre-construction day in 2007, however, I had to leave -- but I was there to see the beginning of what I'd worked so hard for. Turns out the lesson I learned about this type of sounding equipment, a sub-bottom profiler, would be much more important. I've noticed that my catch rate declines when the boat is in my vicinity. 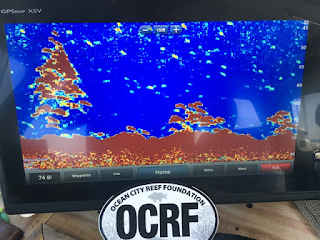 On July 31 I was fishing at an artificial reef 17 NM ESE OC MD. The Scarlett was about 4 miles off to my north and closing. Client's catch rate declined as the ship steamed to just 2 NM NE our position. Suddenly, at about 10:15 the fish bit quite well. That lasted until about 10:40. During that time I noticed the Scarlett was dead in the water. A helicopter came and departed. When they got back underway our catch rate fell off a cliff. I hailed the ship on VHF 16 and switched to channel 10. I asked if they were running a sub-bottom profiler, "Yes." I then asked if the unit had been off from 10:15 to 10:40.. Needing to check with equipment operators; after a few minutes the radioman replied, "Yes, the equipment was off during that time period." The only possible way I could have known what time the equipment was off was by fish behavior. All those notes are still in my log..
We experienced sub-bottom profiler impacts in a huge way while the entire Wind Energy Area was being surveyed & resurveyed. 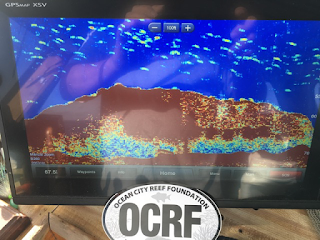 Sub-bottom profiler on for months--not minutes or hours, it drove sea bass and fluke out of an area close to 500 square miles. Fishers inshore had a jubilee -- wonderful flounder fishing especially, and folks marveled as giant hammerhead sharks patrolled the coast instead of 20 miles offshore.. I do not know why, but I am certain a sub-bottom profiler is capable of disrupting the marine ecosystem in grand scale. Here's a video I had put together; underwater footage we shot from my boat w/o clients aboard. Reefs once unbelievably full of sea bass had none. Here's a list of boats I was told--by these boats themselves on VHF radio--who were operating sub-bottom profilers. Sheila Bordenton June 2017 - maybe 48 hours. While most of our reefs are now well into a recovery cycle -- that's what fish do, increase spawning after population decrease or on finding new or unpopulated habitat. In fact, I wrote to fisheries scientists extensively last year with reports of age 1 sea bass switching to male--a behavior I've not seen since 2001. This was because the area where quite nearly all sea bass had been run-off was being recolonized. Nothing gains traction anyway. Habitat--even coral--smack you in the face obviously important fish habitat. Historical seafloor habitat loss in unbelievable scale; how simple it is to create new habitat; manipulating maturity by regulation. ..statistics so good even a 5th grader could plainly see catches are far beyond disingenuous. It really is true that this year's tightening of sea bass regulation to our north is because NOAA "believes" small private boats in New York, (and just NY,) caught more sea bass than all trawlers & cbass trappers from North Carolina to Maine. Oh, and all partyboats & charter boats from NC to ME too. But that's where regulation sources. Not biology or ecology -- just catch statistics unfit to housebreak a puppy.. I'd be ashamed to death to break a man's business with such as that. Now we have a truly popular recreational fishing reef, a reef I first saw a barge sunk on in 1988; a reef I used to be able to keep 40 people busy with over a single armored personnel carrier sunk in Operation Reef Ex; a reef that was declared off limits by a civilian ship with Navy divers aboard on a flat-calm day in June. Not when sea bass are closed, (more & more the case because small boats routinely outfish all trawl & trap in the rec catch data, right?) but in June. Navy probably ain't too used to asking nicely anyway. They got big boats with lots of guns. Jet planes too. Even their little guns are far more powerful than I can buy. Closing a reef on a perfect day, perfect even for an 18 foot outboard. That didn't amount to anything. On the morning of June 2nd, Friday, the Sheila Bordenton declared a one mile CPA (closest point of approach.) The whole reef is one mile wide. The radio operator (skipper?) informed me they were running a sub-bottom profiler. He also informed me they'd sue if their divers, Navy divers, got hooked by lost recreational hooks. Later the boat's CPA was reduced to 1/2 a mile. Later still a 1/4 mile. Their announced destination was the Sub Blenny, a WWII artificial reef I saw sunk in 1989 or 1990. But, like the same operation last summer, they were on --directly above-- the African Queen.. What they were really doing, I haven't any idea. Why in Blazes does the Navy have to charter a supply boat with survey equipment, I couldn't guess either. Don't they have boats? I assure all who will read: the African Queen Reef Site, one of our best, has been impacted. Fishing is brutal there. One private boat angler wrote to me about fishing there Friday, June 2nd: "Seemed like a dead sea." I hope it recolonizes swiftly because this last event was so short. I sent a LOT of emails about it. Jets and cannons vs a keyboard, you might say.. If the Navy wants to come dive our reefs -- wonderful! Just turn off the dang sub-bottom profiler & leave it off! And quit pretending Navy divers deserve a lot more respect than civilian ones -- CPA is 'a safe distance' and not Close The Reef Because We're Here. And the diver who wants to sue because he got a little fish hook in him? He needs a refresher with his Drill Instructor.. Maybe the radio operator could use that same sort of coaching. Below are two comparative pics of the Queen Reef & Jackspot Reef from Sunday, June 4th, the day after the Sheila Bordenton left. I have cause to believe the boat turned off the sub-bottom profiler by Saturday morning as there were some sea bass caught by skilled anglers I know. I'm talking about less than half a dozen cbass among several boats..
Had the equipment been on, however, even 2 miles away, No Bites. Here the instrument's impact would have been point-blank. I am absolutely tired to death of the government screwing up our reef fisheries. Regulation is completely out of hand. No sane argument matters. And, Hey Navy, if you want to dive our reefs, how about helping build some! ..and maybe not in June. How about mothballed Liberty Ships? Shoot the dang things! Take the HE out of torpedoes; let those scuba fellows plant small charges; use 5 inch guns.. Whatever -- go sink something where we can fish later. Not in 10,000 feet of water like all the ships sunk off Puerto Rico & Cuba. I mean really.. So help me we used to kill more sea bass in a day than we do all summer now. And .guv wants to keep careful eye for overfishing. They'll see it too -- in data no one believes. Back then we'd catch a lot of fish and there'd be even more fish the following year. Fishing got better & better because of spawning production. Now the more draconian regulation gets, the worse sea bass fishing gets. Now we have an almost completely dead reef that I used to be able to successfully fish 2 or 3 times a week with 70 passengers. Today I cannot fish there at all. Not and pass the redface test. Sub Blenny on 6/4/17 two days after a brief survey impact ceased. There are no sea bass in this image of about half the 300 foot reef. Some cable and small concrete block piles at Power's Jackspot Reef. Tiny habitat compared to the Blenny; this pic was also taken on 6/4/17, but with sea bass present & behaving normally.